With only 3,000 metres remaining, another barometric switch operated, firing mortars that deployed three pilot chutes into the smooth air stream. These pulled the three main parachutes out from their bays around the tunnel, which slowed the spacecraft's descent to just 8.5 metres per second. 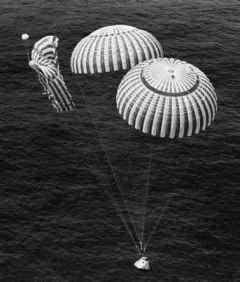 The three main chutes were a welcome sight to the crews and became familiar to the public as the impressive 25-metre red-and-white canopies that featured clearly on the television coverage of an Apollo's return to Earth. Both the main and drogue chutes were deployed in a reefed condition; that is, they were inhibited from inflating properly for the first 10 seconds by a line that ran around the edge of the canopy in order to reduce the mechanical shock of their deployment. A timed pyrotechnic device eventually cut the reefing line to allow the canopies to fully open. ''Going to free fall,'' called Conrad as the drogue chutes disappeared. ''There go the mains!'' yelled Gordon when he saw them replaced by the three glorious main parachutes. ''They're not dereefed yet,'' warned Gordon. They couldn't slow enough until at least two canopies were fully inflated. ''A couple of them are,'' said Gordon. ''One of them isn't yet. There they go,'' as the last reefing cord let go. ''Hello, Houston; Apollo 12,'' he yelled to mission control. ''Three gorgeous, beautiful chutes, and we're at 8,000 feet on the way down in great shape. While the service module had been attached, spacecraft communications on the VHF system had used two scimitar antennae mounted in semicircular housings on either side of the module. For VHF communication between the CM itself and the recovery forces, two small antennae stored beneath the apex cover popped up automatically soon after the main parachutes had been deployed. To use them, the crew had to manually switch the output of the VHF electronics across to the 'Recovery' position. Engineers wisely allowed a generous safety margin by designing the main parachutes to enable the CM to land safely on only two inflated canopies. Their caution was justified when one of the canopies lowering Endeavour, the Apollo 15 CM to the ocean, failed to inflate and instead uselessly streamed beside its two functioning counterparts. The impact speed only rose from 8.5 to just less than 10 metres per second. Apollo 15's CMP Al Worden noted that all three chutes had inflated properly when first deployed so blame was put on the crew's next task, their propellant dump. The propellant tanks for the RCS thrusters still contained much highly noxious propellant, especially hydrazine fuel, and those for the backup RCS ring were still full. As such hazardous substances could not be left on board when swimmers were about to clamber all over the spacecraft after splashdown, the excess propellant was dumped by firing all their thrusters until the tanks were depleted as the spacecraft descended on its three main parachutes. 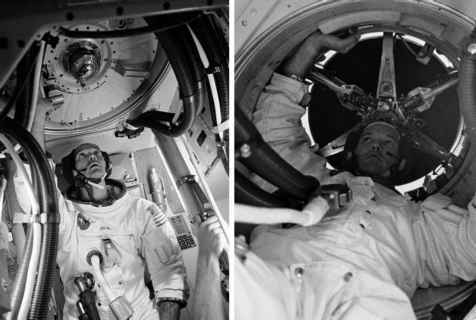 Before doing so, the crew closed the cabin pressure relief valve to prevent RCS fumes from entering the cabin, and instead, fed fresh oxygen from the spacecraft's purge tank into the cabin. The Apollo 15 CM descends with one of its three main parachutes tangled. Once the RCS propellant tanks had been emptied, the system's plumbing was purged with helium gas to remove as much trace propellant as possible from the spacecraft. At 1,000 metres altitude - with the RCS dump completed - the cabin pressure relief valve was set to its dump position, which allowed the cabin's air pressure to finally equalise with the outside atmosphere. It was finally closed 250 metres up, to prevent water entering the cabin at impact. For a short time, the spacecraft would be partially submerged when it hit the water and there was a good chance that it might be upside-down for a few minutes. The parachutes suspended the command module at an angle of 27.5 degrees to the horizontal with the main hatch facing upwards. This caused the hull to hit the water 'toe first', in a fashion that spread their final deceleration over the longest possible time. Also, the periphery of the CM structure was formed by shaped ribs. Those opposite the hatch, where the spacecraft would contact the water first, were designed to be crushable to help to reduce the force of impact. They were primarily intended for the undesirable contingency of a land impact but could deform to help to reduce the shock of a conventional sea landing.